"Utah, Death and Military Death Certificates, 1904–1961", digital image, Ancestry.com, "Lavera Wulffenstein, d. LDS Hospital, Salt Lake City, Utah, 17 Apr 1920, res. Frisco, Utah, married, husband Murn Wulffenstein, age 19-1-19, housewife, b. Frisco, Utah, 28 Feb 1901, father Frank E Sackett b. Salt Lake City, mother Addie May Ellison b. Beaver, Utah, informant Murn Wulffenstein, cause infectious? angiocholitis, removal Beaver, Utah." 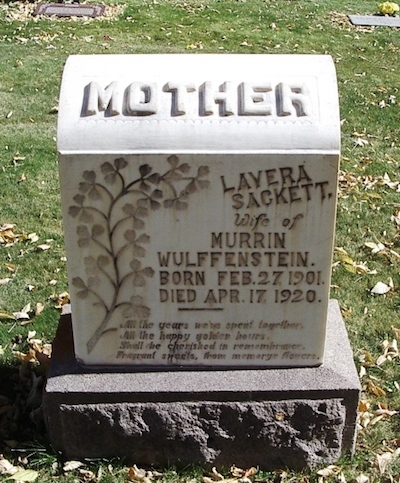 "Utah Cemetery Inventory", database, Ancestry.com, "Lavera Sackett Wulffenstein, b. 27 Feb 1901, d. 17 Apr 1920, bur. Mountain View Cemetery, grave B_11_5." "Utah, County Marriages, 1887–1937", database, Ancestry.com, "2 Sep 1918, Beaver, Utah, Mcmurrin Wulffenstein, 19, and Lavera Sackett, 17." US Social Security Administration, "Social Security Death Index", database, American Ancestors, "Wulffenstein, McMurrin, b. 23 Feb 1899, d. Apr 1968, last res. 84770 Saint George, Washington, Utah. SSN issued Nevada bef. 1951." Wulfenstein, LaVera, wife, 18, b. UT, father b. UT, mother b. UT.